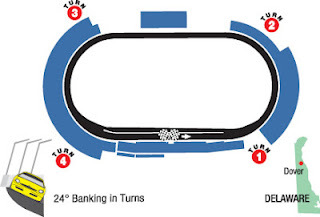 The Likely Suspects: Dover International Speedway is my hometrack, and one of those places where racing is equally exciting for the drivers as well as the fans. Look for fast speeds and awesome racing with these drivers performing well: Jimmie Johnson, Matt Kenseth, Mark Martin, Kyle Busch, Clint Bowyer, Joey Logano, Carl Edwards (aka Concrete Carl) and Greg Biffle. My 2 Cents: Jimmie Johnson and Matt Kenseth take the coveted no-brainer picks this week. Alas, I have no Johnson picks left, so I am struggling between Jeff Gordon and Brad Keselowki. Kevin Harvick and Clint Bowyer are also worthy of your consideration. My next picks are Carl Edwards, Ryan Newman, Mark Martin and Greg Biffle. Note that if you have Busch brothers starts left, go with Kyle and pull Greg Biffle. I will round out my team with A.J. Allmendinger and Ricky Stenhouse Jr. Good luck with your team and enjoy the race!